Here are a variety of tips and tweaks for Windows 8. The new Windows 8 Explorer focuses on three tabs at the top: Home, Share, and View. Another reason for embracing the new ribbon can be seen in this interesting screenshot below, check out the approximate popularity of the various file operations. If you want to find one of the Apps. Assuming that you are at the Metro UI, just press a letter on your keyboard! Here is a screenshot of what happened when I tried ‘i’. (No need to launch Explorer or bring up the Charms and Search). Bring up the 5 ‘Charms’, then select ‘Settings’. Seek out the Power button, from there you can Shut down or restart Windows 8. Incidentally, one way of getting the ‘Charms’ is to press Winkey +c. As usual Microsoft provide two way of doing everything, you can manage the notification 'Toasts' from with the Windows 8 app. A little-known feature is the ability to turn off notifications temporarily if you don't want to be disturbed while concentrating intensively on a task. 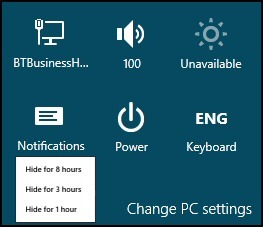 See 'Hide for… hours' on the screenshot above right. Then return to the Metro UI and Pin your shortcut. For more detailed instructions on creating a tile for your Metro UI, see here. The combination of Winkey +c brings up the five ‘Charms’ see above screenshot. You may already know that the Windows key on its own switches to the classic desktop. Also if you are in an App then Winkey acts as return. See more Windows 8 keyboard shortcuts. Libraries are slow to gain acceptance in Windows 7, let us hope that a tiny change – the ability to change the icon will kick-start interest in this useful feature. 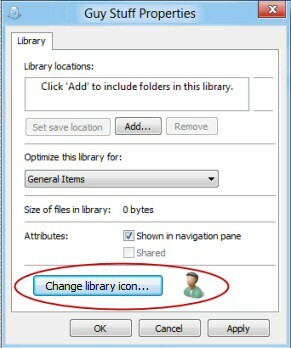 My Windows 8 tip is to right-click a custom library, then seek the Change library icon… See Windows 8 screenshot. to the right. Note: I have not found a way of changing the icon for built-in Windows 8 libraries. Go straight to the Control Panel –> Appearance and Personalization, then ‘Show hidden files and folders’. The secret of understanding SmartScreen is not to think of ‘Screen’ as meaning monitor, but as protection against malicious files. ‘Never run downloaded programs that are unknown to SmartScreen’. Rather than complain about the UAC’s nagging, head for the Action Center in the Control Panel and select a less intrusive the setting. Another way of finding out how to change the user setting control is call for Help and support then type ‘UAC’. Change User Account Control settings. The purpose of this tip is to alert you to different User Account Control settings for administrators and ordinary users. Launch Secpol.msc, and yes do remember the .msc extension. This is not so much a Windows 8 tip as remembering a golden oldie that saves error messages when you run built-in troubleshooting programs. 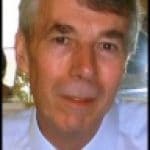 There a quite a few programs that benefit from a right-click and ‘Run as Administrator’. Naturally, you have to be in troubleshooting mode before you launch programs such as cmd.exe, regedit, gpedit.msc or secpol.msc. with elevated privileges that come with ‘Run as Administrator’. 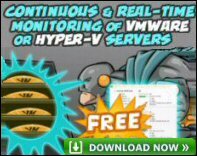 The idea of Hyper-Visor is to enable guest OS to run concurrently on a Windows 8 host. 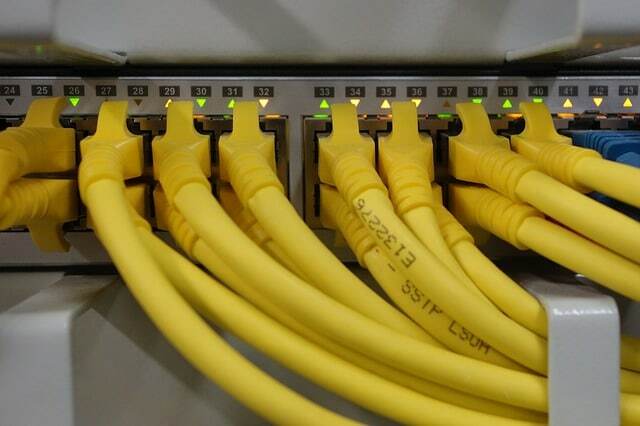 The advantage is that it saves space and hardware costs. You can install Windows 8 Hyper-V from the Control Panel, seek out ‘Turn Windows features on or off’ and remember to tick the box, reboot and Hyper-V is ready. The first reason for adjusting your Windows 8 library is to specify which underlying folders contribute to ‘My Music, Pictures, Videos and especially, Documents’. The second reason is to make sure that your commonly used files are indexed, thus search quickly. If you want to add folders from the c: \ drive or even another drive, go to that folder, right-click and select Include in library, finally, decide whether to include into the Documents sub-library or one of the other predetermined categories. 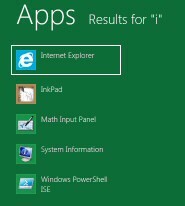 To narrow down your search in Windows 8 use AND, for example Guns and Rifles. The benefit it reduces the results to items containing both words. No I am not shouting! A N D needs to be in capitals. Windows 8 search treats Guns and Rifles differently from Guns and Rifles. Check the Index settings in the Control Panel. I tend to keep adding more and more locations, however, my friend Mick is constantly whittling down the areas on his Windows 8 machines that are indexed, that’s because he’s a gamer and wants his machine to run as fast as possible. Me, I am more interested in being able to find files quickly. Windows 8 thrives on the latest hard drives with SSD (Solid State Drives). They are innately faster because unlike conventional disk drives, there is no wait for spinning and no head seek delay. It seems that for laptops benefit from lower energy demands, thus longer battery life. As they have no moving parts, I can believe claims that they are more reliable than the old disks, especially as I have had 3 HDD failures in the last 2 years. What ever your disk type I suggest you segment the disk; divide and rule your data. With today’s massive disks I find it convenient to have 3 or 4 different partitions to store my data away from the operating system on the C:\. To partition, or leave as one big drive is the subject to fashion. After years of no partitioning, it now seems fashionable again to at least have a D:\. This freeware utility is designed to adjust settings that are not available, at least in Build 8102 of Windows 8. It works for both 32 and 64-bit versions. Disable the new Metro Start Screen. This function requires editing a System File. It does not remove the file. Disable Metro Ribbon. Disables only the Metro Ribbon UI. Disable the Metro Start Menu and Ribbon UI, Metro Task Manager UI and the Lock Screen. 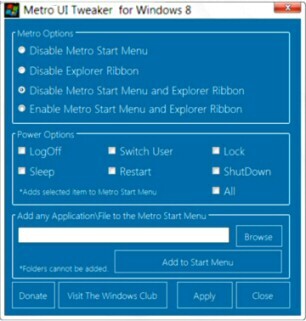 Enable Metro Start Menu and Ribbon. Reverses the above action. Add Power Options to the Metro Start Screen. Adds Logoff, Switch User, Lock, Sleep, Restart and Shutdown tiles. Add your selection of Applications to the Metro UI Start Screen. 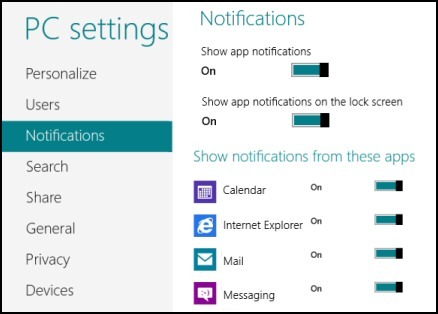 Allows you to add those apps and files that may not be normally available to you to the Start screen. The Windows 8 Metro Tweaker will be updated with more tweaks from time to time . Download your freeware copy of Metro UI Tweaker. So far, my favourite Metro UI emulator to see Windows 8’s Metro UI is Mosaic. From its live widgets you can run your Windows 7 applications, thus get a preview of Windows 8 desktop. 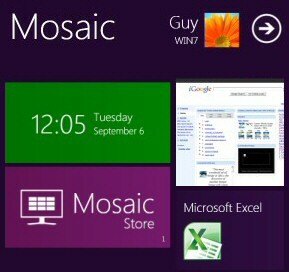 Using the arrow (see screenshot) you can add more of your current programs to the Mosaic Windows 8 UI emulator. Note, you also need Microsoft .NET Framework 4.0. Naturally, this does not turn your Windows 7 machine into Windows 8, but it does give you a look and feel of the new user interface. You could also get the Omnimo 4 skin, which brings a replica of the Windows 8 Start screen to Windows 7. The Omnimo screen is rather like that of a Windows Phone 7. Not only with this app mimic Windows 8, but also it will transform your desktop into new productive area. Each tile is interactive and gives you customisable information. 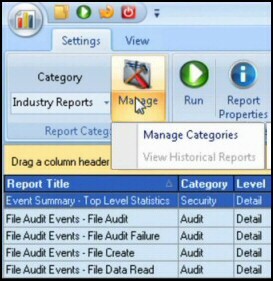 See more about Omnimo and download the latest version. 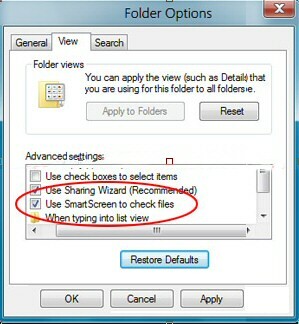 Here is a selection of Windows 8 tips, no doubt they will grow, especially if you send in your favourite tweaks.